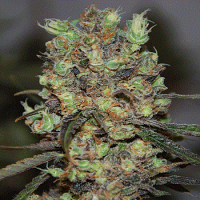 Psychofruit Auto Feminized Cannabis Seeds by Cream of The Crop Seeds: Super-fast and aggressively potent, the classic Blueberry has been given a mad twist with scary results. Far from unstable, this baby grows hard compact buds of red, purple and blue, surprising growers with her mesmerising colour displays. 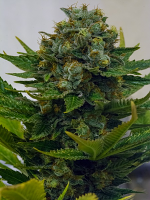 She has a soft, fruity side with an intense Blueberry/Skunk taste, but does have another personality that is dark, uncompromising and very powerful, owing thanks to the Critical+. With a strong, euphoric and very long lasting high, she truly is… ….PSYCOTHERAPY GONE MENTAL!!! !